At Cruise Limousines we pride ourselves on the Quality of our service and the presentation of our cars. There are a wide variety of Limousines, Vintage cars and Prestige cars for you to choose from all complete with a fully uniformed chauffeur. Cruise Limousines are based in Biddulph, Stoke-on-Trent, Staffordshire. We offer very high class, chauffeur-driven stretch limousines, making sure we put our customers first in every way. Our chauffeurs are chosen not only for their driving skills but for their commitment, attention to detail and reliability, making sure that you have a very enjoyable day. People hire our luxury stretch limousines for Wedding Cars, Hen Nights, Birthday Parties, Anniversaries, Restaurants, Sports Meetings, Race Days, School Proms, Airport runs or just to make themselves feel special! We guarantee if you hire one of our stretch limousines, whatever the occasion we are sure you will have a wonderful, enjoyable time. Our limousines have the latest entertainment equipment installed including a Bar, TV, CD, DVD, Playstation, Neon lighting and Air conditioning. Cruise Limousines can s-t-r-e-t-c-h your imagination, if you have somewhere to go, we have a chauffeur driven car, to take you there in style. We cover areas such as Biddulph, Congleton, Crewe, Macclesfield, Leek, Stoke-on-Trent, Sandbach and all surrounding areas including most of Cheshire and North Staffordshire. 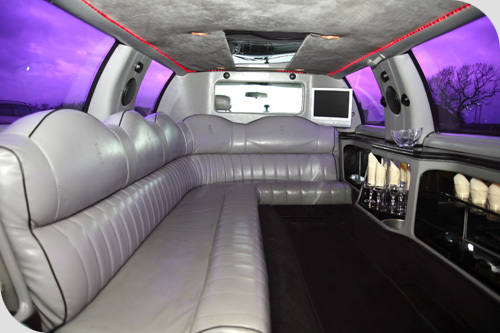 For more information about our stretch limousine hire, please call us on 01782 523895. Mob: 07970 980889 and s-t-r-e-t-c-h your imagination.